Cockle Bay’s Rex Sellers, one of New Zealand’s most successful yachtsmen, has narrowly missed out on securing third place at the 2019 Tornado World Championships in Takapuna this week. Sellers, sailing with son Brett, managed to become this year’s New Zealand champions following racing last week on the North Shore. Last week’s event – the 2019 NZL Open Nationals – was a warm-up regatta for some crews for the World Championships hosted by the same club, so there were 14 boats from six different countries participating. 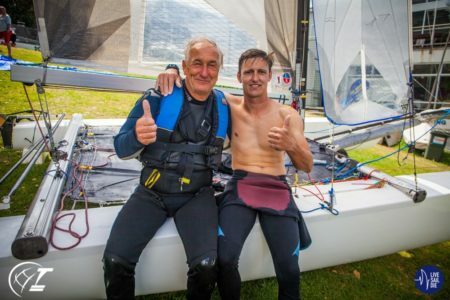 Rex, a gold and silver Olympic medallist, and his son finished the World Championships with a fantastic final day of racing on Tuesday. They took the win for race 10, a great way to end the regatta. But it wasn’t enough to get them on the podium, missing out on third place by just one point. Australian duo Brett Burvill and Max Puttman claimed the overall title, the first time that this team has won the event.